Children in a B.C. First Nations community show off their back pack filled with school supplies. 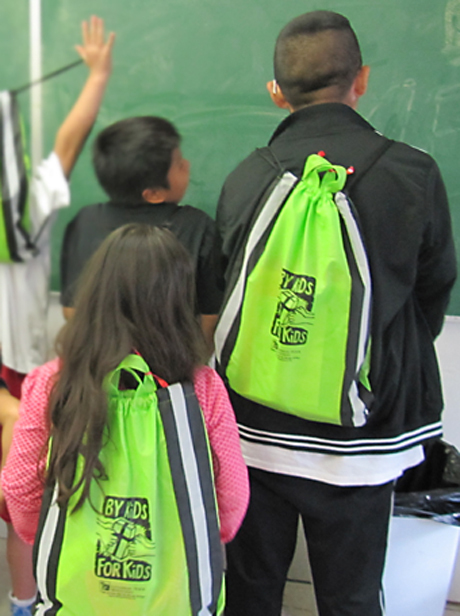 Lutheran Church–Canada congregations helped outfit First Nations children in a half dozen remote British Columbia coastal communities with school supplies and colourful backpacks. The joint project of the BC Mission Boat Society based in Parksville, B.C. (Our Savior Lutheran Church) and Lutheran Hour Ministries of Kitchener, Ontario “was a great way to show God’s love,” says mission boat society executive director Marcus Huff. The society sends staff to the First Nations villages year-round, visiting shut-ins and elders, providing programs for children and helping local Christians do ministry. Only one of the six communities has a full-time pastor. But during the summer months the seas are gentle enough for volunteer mission teams to travel on the society’s 42-ft motor vessel, Tyee J. The workers are “of all ages,” says Huff. The rest of the year staff and volunteers travel by cars and seaplanes. The mission boat society handed out about 100 packs this summer and expects to hand out at least another hundred this fall; it gave out 200 last year, which was the first time By Kids for Kids was implemented. “Teachers in the schools told us their budgets had been cut so much they couldn’t give their students basic supplies,” says Huff. Huff noted that mission boats have been on the B.C. coast for a hundred years, and he knows of at least two others still working: North American Indigenous Ministries and Coastal Ministries. BC Mission Boat Society is a Listed Service Organization of Lutheran Church–Canada. For more information visit the society’s website.